We're pretty settled in down here in our nation's capital, and are adjusting to the new house, higher humidity, and Metro knitting. So let me catch you up a bit! My birthday was about a month before we left Boston, and Alison thoughtfully gifted me some beautiful Canasta by Ellyn Cooper's Yarn Sonnets. After some false starts ("It's going to be Tubey. Wait, no...*rip* ... it's Clapotis! 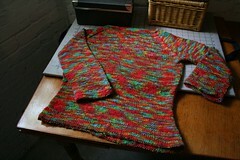 No, that's not it either...*rip*...") I decided on using it to make a modified Hourglass Sweater (from LMKG). I made the sweater with 3/4-length sleeves to conserve yarn, and knit the pieces flat up to the armholes to give it some additional structure. Once up to the armholes, I joined all of the pieces and knit the rest in the round -- adding several extra rounds at the top to maximize strap coverage. The yarn was a real pleasure to knit with, and while I had to alternate skeins from the bottom to the armholes to prevent pooling, once I started the decreases I found it wasn't necessary. I can't wait until it's no so hot and humid here, and I can actually wear it! 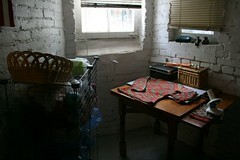 Last weekend I finally set up my knitting area in the basement. I have big plans for this little nook, but for the time begin I'll settle for my yarn, blocking board, ball winder, and swift being out of boxes and in a place where I can use them again. Hooray! Some of you might have gathered or heard that Johanna and her hubby have taken over our Boston-area apartment and are happily getting it ready for their baby. It's wonderful that somebody we know and like moved into our place (and that there's still knitting going on there! ), though pictures like this one still throw me for a loop -- hey, that's our old porch! Anyway, Johanna was very sweet and sent me some lovely pink and brown Koigu after hearing me complain endlessly that I couldn't find this colorway of Artyarns Supermerino. Her generosity raises a dilemma, though. I was originally looking for the Supermerino to make a pair of socks as a gift. 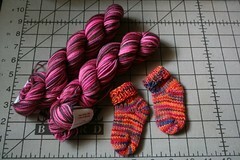 Now that I have the comparable colorway in the incomparable Koigu, am I going to be able to give away the final product? Stay tuned! Finally, the itty-bitty baby socks are what happened when I finished the projects on my needles, but had yet to unpack my yarn or pattern books. What to do? Why, cast on for baby socks, of course! I used remnants from the Koigu socks I made for our real estate agent who was so instrumental in us getting this house we love so much. You can see a very blurry picture of them here, and a picture of the colorway here. The baby socks will soon be winging their way to a friend who just found out she's expecting her first baby -- they don't know if they are having a boy or a girl, but I figured this colorway would do either way. So now what? I don't know. Maybe it's all of the moving-related upheaval, but I'm having trouble deciding on a new project. Not to worry, though -- my friends and family are doing their best to increase the earth's population these days, so there's always baby knitting to be done! Posted by shannon at July 25, 2006 5:17 PM | For related posts: For Me!